Ryan & Josh Shook sons of Kerry and Chris Shook authors of One Month To Live have written a very relevant and necessary book for this generation in firsthand. Ryan & Josh grew up in church but as they got older they realized their need to find their own faith instead of relying on the faith of their parents or teachers. They have used their own personal struggles in achieving an authentic faith to write firsthand. 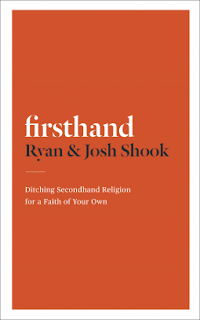 Firsthand deals with replacing secondhand religion with a faith that is your own, a firsthand faith. Secondhand religion is the religion that you accept as your own but it really belongs to someone else and has been passed down to you either by parents or teachers. You accept and believe things because someone else does. The book firsthand challenges you to look at what you believe and build a relationship with Christ for yourself. I really believe this book is necessary. There are so many young people who are questioning whether the church or God are relevant in their lives. They are living the Christian life on shaky ground because they do not have a faith of their own. They have a faith that is borrowed from someone else. They will eventually find their own faith the hard way or turn away from Christianity all together. Firsthand's goal is to help people who are struggling with second hand religion find their own firsthand faith. Each chapter in the book is followed up by questions for the reader to answer as well as testimonials from others who have struggled to find their own faith. This book was a pretty easy read. Usually I am not a fan of easy read books but I think that in this case the fact that it is an easy read is a good thing. The reader really needs to focus on their own lives and answer some pretty challenging questions in order to gain their firsthand faith. If this book's difficulty level were any harder it would get in the way of the purpose of the book especially when dealing with a generation of readers who are use to reading online in the format of blogs, wiki's, Tweets and Facebook. I am recommending firsthand as a Christian growth and development tool not as a Bible Study. If you are struggling with your experiences in church, with the Christian life, or are a ministry leader who has noticed that people in your ministry may be struggling you could very well benefit from using this book.